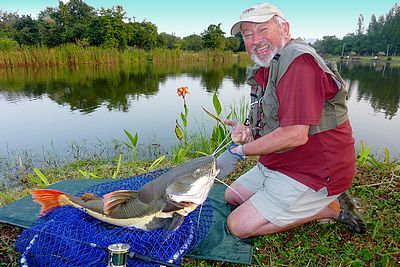 There is no need to convince the millions and avid outdoors men and women, who get excited by reeling in a 30-pound catfish in Thailand or seeing a beautiful brown trout rise to a fly on the Blackwater Co Cork, why they need to start making plans to head outside. But if for some reason, you need a little convincing, I have compiled a list of 10 good examples that might just offer you an excuse to call in sick to work or leave/take the ones you care about, for another weekend …so you too can spend a day fishing. 1. Contribute to Conservation: Anglers put their money where their mouth is and are passionate about the environment. By purchasing fishing licenses (Not an issue in Thailand) and paying special taxes that they themselves have agreed upon anglers have helped to fund many of the wildlife and conservation programs that exist in Europe and beyond. They also contribute to non-game and education programs, and to the purchase of thousands of acres of public lands, where everyone is welcome to recreate year round. Anglers are also acutely aware of the importance of clean water and air and pride themselves on protecting and preserving our environment, natural communities, and valuable habitat. 3. Social Bonding: Sharing a fishing experience helps strengthen relationships with family and friends. It also offers a person the chance to give back to society through mentoring others in the pleasure and importance of being good stewards of our natural resources. 4. Supports Wildlife and Fisheries Management: Angling is an important wildlife management tool. For more than 100 years anglers have helped to contribute to wildlife and fisheries management efforts by helping to set seasons and creel limits. Wildlife populations of most fish species remain stable and in some cases flourish, a far cry from a decade ago when many species suffered from over harvest and the ill effects of pollution. Anglers also have a vested interest in and support many efforts to preserve and protect all species and the environment-all the while helping to increase biodiversity. 5. Health Benefits: A high percent of western individuals are overweight. Being outside and being active helps to make you feel better and encourages a healthier way of life. Driving to your local sports bar or local fast food falang restaurant might be convenient, but fishing can also help you burn those unwanted calories, increase the quality of your lifestyle, and add years to your life. 6. Recreation: Having a bad day of fishing still beats a day at work or sitting in a Thai bar watching life pass. The most common reason you will find with people who like to fish is that it is simply fun, Getting out and about with a cool beer in the box and anticipating that the next 5 minutes will hook you the world record. 7. Self-Fulfilment: Fishing offers you the chance to improve your self-esteem through respect for the environment, mastering outdoor skills and achieving personal goals. Fishing can also play an important role in one’s personal and social development. Fishing is a lifetime skill and activity that can be enjoyed at any age. Just ask a youngster who reeled in their first fish how much fun fishing can be. 8. Boost to the Economy: Anglers generate revenue for business in Thailand and directly support jobs that give an economic boost that any local community would be pleased with. 9. Fishing for Food: Wild fish are low in fat and cholesterol and high in protein. In fact, Heart Associations recommend a regular diet of fish. Besides it’s a lot more challenging to catch that plate of fresh fish than to stroll endlessly down a TOPS aisle if you decide to keep your catch. 10. The Thrill: Fishing has a way of fulfilling an age-old need of pursuing and catching. The thrill lies in the challenge, such as stalking an elusive fish. But there are many who will be quick to profess that it’s not the catching of fish that’s important, but the immeasurable life lessons that you will experience along the way.